The announcement made it to the BBC local news. In October the Cabinet of Dover District Council considered a report to make long awaited repairs to Deal pier. Unfortunately the proposal only included partial replacement of the seating, which is almost non-existent as most of it rotted away and has been removed. We are pleased that the council is committing over half a million pounds to rectify the decay that has taken place on the pier. 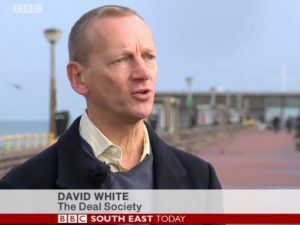 Their press release is at www.dover.gov.uk/News/Press-Releases/2017/12m-Investment-As-Deal-Pier-Celebrates-Diamond-Anniversary.aspx.